Commodity Trading: Which Option Options (if any) Belong in Your Portfolio? So says Jared Cummans (www.CommodityHQ.com) in edited excerpts from his original article* entitled What Are Options? The Ultimate Beginner’s Guide. Options are the right but not the obligation to buy or sell a specified asset for a set price on a set date. Once purchased, you have the option of executing the order, but you can always let it expire without any kind of penalty or backlash. Options can be used on a fair amount of stocks as well as a large variety of commodities in order to make speculative bets, or to hedge risk. Note that while these are used to mitigate risk, improper use can actually lead to more risk in an underlying position, so always proceed with caution. There are a wide variety of options styles that investors can utilize, but the two most prominent, by far, are calls and puts. Calls are options that give the owner the right to buy a specified asset at a set price on a set date. Think of it as going long in said underlying commodity, as you always want the price of the underlier to increase. To give you an example of a call contract, let’s say that corn futures are currently trading for $2. You can purchase a call option for a specified price (we’ll say $3 for simplicity) on a pre-determined maturity. Corn prices then surge to $4 and your option is now “in the money” as you can execute it for a profit. Assuming your option has not expired, you now have the right to purchase corn futures for $3 even though they are worth $4, instantly creating value upon purchase. Puts are options that give the owner the right to sell a specified asset at a set price on a set date. A put should be thought of as a short position (and is often a safer alternative to one) as you are hoping for a decrease in the price of the underlier. Let’s use the same corn example, with futures trading at $2 again. Only this time, you have purchased a put for $1. Luckily enough, corn prices slide to just $0.20 leaving you in the money again. You now have the option to sell corn futures for $1 even though they are only worth a mere 20 cents. It is also important to remember that selling your options can make a fair amount of money for smaller investors. Buying options for 1,000 barrels of oil may not be very useful to someone with a small capital base, but if your position performs well, there is always someone willing to purchase the option from you for a premium. In fact, many investors simply use options so that they can re-sell them at a profit, rather than actually executing the contracts. Note that there are also multiple other styles of options contracts that more serious investors can use like straddles, strangle, iron condor, butterfly, and many others. We would highly recommend you master the calls and puts before moving on to these more complex choices. This is a tough question to answer. To put it plain and simple, only those who actually understand options should use them. While that seems fairly obvious, a number of investors dabble with options without fully understanding them and often end up with a sour trade. As with futures contracts, only those who fully appreciate their complexities and risks should trade them. Owning these contracts requires consistent management and a watchful eye, as a position can unravel in a matter of hours. When it comes to commodities, futures contracts are difficult to manage on their own, throw options on top of that, and you’ve got yourself one hefty investment. Using options on futures is reserved for the upper echelon of traders who are savvy with both futures and options on their own. That being said, utilizing options can often be a better way of maintaining commodity exposure as it can reduce risk if executed properly. 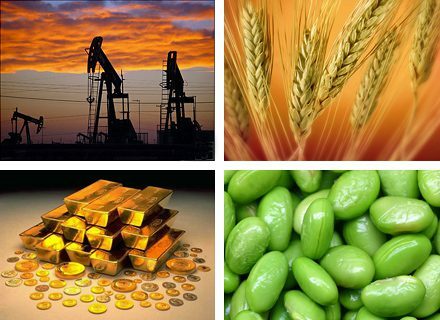 Below we outline some of the most popular commodity exchanges in the world to help you find the best place to utilize options. Chicago Mercantile Exchange (CME): The CME is a financial and commodity derivatives trading platform headquartered in Chicago. Originally founded in 1898 as the Chicago Butter and Egg Board, the CME has one of the largest options and futures line-up of any exchange in the world. The CME offers contracts of all kinds including agriculture, credit, economic events, equity index, FX, interest rates and other futures/options investments. The CME is owned and operates under the CME Group. New York Mercantile Exchange (NYMEX): The NYMEX is the world’s largest physical commodity futures exchange, offering exposure to a wide variety of products. Commodity Exchange Inc. (COMEX) also operates as a division of the NYMEX and is best known for offering exposure to various metals contracts. The two divisions joined in late 2006, and were acquired by the CME Group in early 2008. 4. What Are Warrants, Options & LEAPS? Previous We've Reached the Tipping Point: Are Consumers Prepared to Save the Day? Next Futures Investing: Should It Be In Your Future?